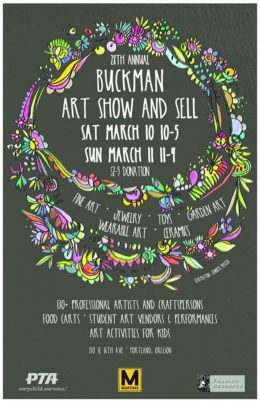 Stop by Buckman this weekend for the famous Art Show & Sell, taking place 10-5 on Saturday and 11-4 on Sunday, March 9-10. 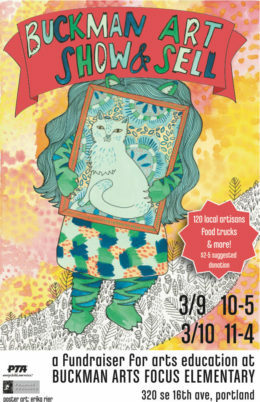 Shop creations from over 120 local artisans and artists and enjoy free art activities, face painting, and fun! 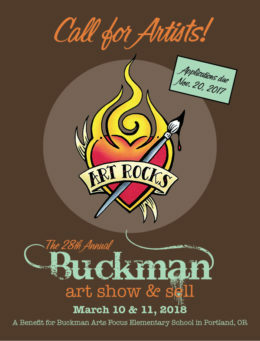 For a full listing of artists and other important details, check out the Art Show and Sell website. There’s already a ton going on this school year, and it can be hard to keep track, so we’re compiling a quick reminder post of what’s ahead for the next two weeks! eer, with $1 per pint going to the Buckman playground project! Stop by 3-6pm (or even a bit before pickup, time is approximate) to celebrate and order yourself a drink. Good beer for a good cause! Oct 28 – 11am – 1pm – It’s a Halloween spooktacular event; the annual Bowl-A-Ween party! Head to Grand Central Bowl for a Buckman takeover and enjoy bowling, food, games, raffles, and more! Admission is sliding scale and includes shoes. This is one of Buckman’s most-loved traditions. Costumes encouraged! Nov 7 – 5pm – 8pm – Buckman Dines Out at Blackheart – This new, Buckman-managed punk bar is kid-friendly until 8pm and serves breakfast all day. Sample one of their amazing signature cocktails! 20% of proceeds benefit the Foundation! Nov 9 – 8:45-9:30am -PTA Coffee Chat with Principal Kosmala – Join the PTA and other members of the Buckman community to get up-to-speed on all things Buckman. These are informal events and often feature a Q+A with Principal Kosmala. Head to the library after drop-off unless otherwise noted. Nov 14 – 7pm – Another excuse to go to West Coast Grocery Company: Pub Night! Learn about the Foundation and ways to get involved, or just sit back and enjoy your drink of choice with other parents and community members. Meeting was called to order at 6:30 pm by Charmian Creagle. Review and vote to approve minutes from February 6, 2018 PTA meeting. Charmian asked Patricia to read and review the minutes from February’s meeting. Patricia read over the meeting minutes. A parent motioned to approve and another parent seconded the motion. It was unanimously approved. Budget review. Andrea talked about what was raised and made at ASAS ($29,000 net profits). $4,500 has been raised in memory of Lauren’s neighbor for the playground project. She also talked about people buying SCRIP to help raise money for the school. She also mentioned the PTA doing a fundraiser to match any donations up to $500 for anyone that can help give a little something to SCRIP towards the SUN families that need it. Back to reviewing the budget, Andrea said that the PTA is about $14,000 ahead of the budget. Eric Schopmeyer, $870 for a short-throw projector for cafetorium. Michelle motioned to approve it and Meredith seconded it and it was unanimously approved. Andrea also went over the other grants that were approved by the board. Michelle Cacka needing supplies and Ed Matthew needing extension cords and LED lighting strip for ASAS. It was time to vote on next year’s budget. Amanda approves to approve the budget and Karen seconded it. It was unanimously approved. Michelle gave a recap on how the ASAS weekend went. We used 5th graders this year for the volunteer team but we were still 50 volunteers short from last year. Tear down had 8 volunteers sign up to tear down and 2 showed up, the committee that had already been there all weekend had to stay and help. We made $29,000. A lot of our vending prices went up and we are going to try and simplify it next year by selling a booth (application fee still in place and they have to jury in and a booth fee). We would make about the same amount and need less volunteers. Hospitality team would feed the Friday night set up crew and the Sunday afternoon tear down crew. Auction update by Lauren Creany. She explained how the foundation works. Foundation is the only way we can raise money for the staffing needs such as the arts team. Our goal is to raise $90,000 net for the whole year. $70,000 would keep all the arts team and Ms. Rudnik but the extra $20,000 would be able to pay for Andrea White to be here one full day (Wednesday) working with different grade levels on their performances. Movie night is next Tuesday and the foundation needs volunteers. Dines Out next is April 25 at Buckman Public House. Charmian mentioned the bulletin board and the drawings of the fourth graders for the playground and how the sessions went with all the 4th grade classes. What will happen next is that Learning Landscapes will take the designs and the needed wants and speak with Ms. Kosmala and PPS to make sure there are no safety issues. We will then immediately jump in and start doing some grant writing with a volunteer parent grant writing team that we have. STEAM night which is in 2 days, Thursday April 12. No school (teacher planning day) on Friday, April 13. 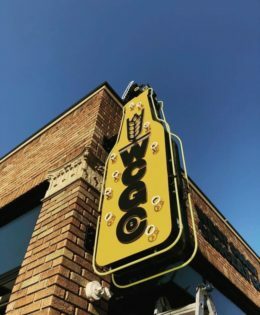 April 18th is a 2 hour late opening. April 20 is the monthly coffee chat. We will have a speaker from Moms Demand Action, Erica Vaughn in the library. April 20 is class picture day. 7:20 Susan Kosmala presented safety issues at Buckman. She explained what the safety committee is. It is state mandated committee that covers all safety things related at the school. PPS also requires that every school has an emergency response team so both of those roles are rolled into one committee (safety committee). She also debriefed us on how the emergency drills have taken place at the school and that if they had to evacuate the school for any emergency were they couldn’t stay at the school they would walk 3 blocks to Revolution Hall (New Seasons Market headquarters). She talked about Safer Routes and the problems with no school street signs. Safer Routes is more interested in getting speed bumps that more signs even though signs would probably be cheaper. Susan said she would contact Safer Routes/PBOT to come back out to the school to monitor the traffic and parking problems in the afternoon pick up. One idea for fall 2018 is to hold a PTA earthquake kit drive for the teachers to have such things as tarps, gently used tents that families might be giving away, extra flashlights, ponchos or emergency blankets.